This album was created by Bob Obenhaus in 1951 while he was a senior and a member of the photography club at Highland Park High School. The flooding of the Kansas River caused widespread damage across Topeka, which Obenhaus captured comprehensively on film. His photographs include flooded businesses, grain elevators, railroads, hotels, bridges, the Owl Ball Park, homes, and overall views of the city from the Capitol dome. The digitization of this project was funded by the National Historical Publications and Records Commission through the Kansas State Historical Records Advisory Board. 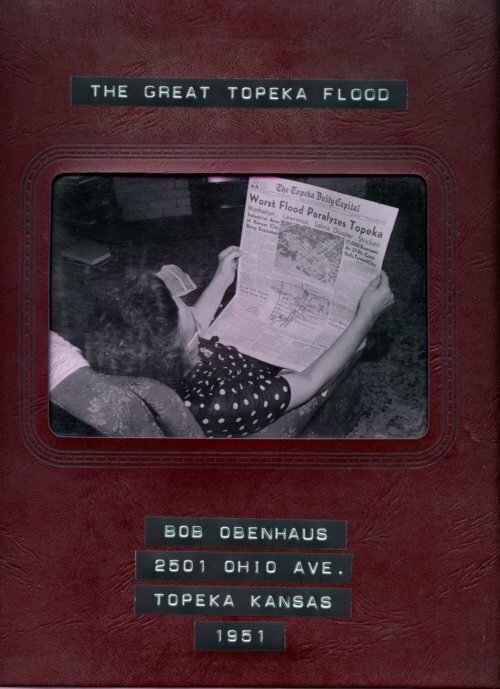 The Great Topeka Flood album - Cover of photograph album created by Bob Obenhaus, 2501 Ohio, Topeka, Kansas in 1951. Bob was a high school student at the time and was in the photography club.